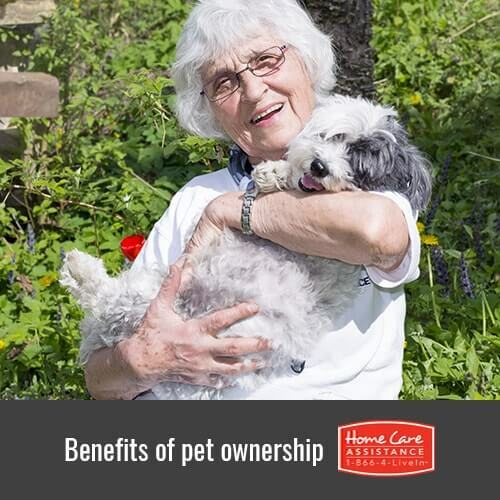 When seniors have pets living at home, it can be of great benefit to them. Studies show that animals can significantly enhance the health and wellbeing of their owners. Seniors living in retirement homes or those who have elder care in Oshkosh are among those who reap the greatest benefits from pet ownership. Loneliness is particularly challenging for seniors. As people age, they can easily become withdrawn and isolated. The bond that is formed between pet and owner keeps seniors social and gives them a source of companionship. This in turn will stave off feelings of depression and safeguards their mental health. When animals have needs, they don’t mind letting us know. Whether it is to be taken for a walk, fed, or simply cuddled, a pet can motivate someone to get up and move around. Playing with a pet is not only good exercise for the animal, but for the person as well. Animals can be a useful and welcome distraction for those with minor aches and pains. This leads to fewer visits to the doctor as well as reduced need for medication, which in turn lowers the overall healthcare costs. Stroking and petting a cat or dog causes the body to release hormones and chemicals such as oxytocin, serotonin and prolactin, which promote a sense of happiness and wellbeing. This release of chemicals helps stave off feelings of sadness, anger, and loneliness. Seniors who require Oshkosh post-stroke care may also benefit from pet ownership. Petting an animal has been shown to lower blood pressure and reduce stress levels. These effects consequently lower cholesterol levels and reduce senior heart rate, thereby reducing the risk of heart disease and stroke. Cat owners in particular are much less likely to experience heart disease than those do not have a feline companion. Pet ownership isn’t the only way seniors can enjoy health and wellbeing during their golden years. Home Care Assistance provides flexible hourly and live-in home care in Oshkosh that promotes a healthy balance of nutritious diet, daily physical activity, and socialization. This balanced lifestyle promotes senior wellness and longevity in the comfort of home. Learn more when you call (920) 710-2273 today and speak with a friendly Care Manager.